اسکارن جوینان در فاصله 115 کیلومتری شمال باختر اصفهان (40 کیلومتری جنوب کاشان و خاور قهرود)، در پهنه ساختاری ایران مرکزی قرار دارد که در همبری توده نفوذی گرانیتوییدی قهرود (به سن میوسن میانی) با واحد شیل و ماسه­سنگ با میان‎لایه­های آهکی سازند شمشک به سن ژوراسیک گسترش یافته است. اسکارن­سازی متشکل از دو زیرپهنه درون‎اسکارن و برون‎اسکارن است. در این اسکارن­ها کانه‎زایی گسترده­ای رخ نداده است. درون‎اسکارن گسترش محدود (از چند میلی‌متر تا چند سانتی‌متر) و اگزواسکارن بیشترین گسترش را دارد (از یک متر تا بیش از ده متر). اندواسکارن با تشکیل کانی‌های گارنت، پیروکسن، پلاژیوکلاز، اپیدوت و اسفن در زمینه توده نفوذی در مجاورت بخش کربناته نمود دارد. در مجاورت بلافصل آن، اگزواسکارن با تشکیل کانی­های گارنت، پیروکسن، وزوویانیت، اپیدوت، فلوگوپیت، کلریت، کوارتز و کلسیت در بخش کربنات آغاز می­شود. بررسی­های کانی­شناسی و روابط بافتی کانی­ها بیانگر پیشرفت دگرگونی تا رخساره پیروکسن هورنفلس در سنگ­های اسکارنی این منطقه است. Javinan skarn is located at 115 km north west of Isfahan (40 km south of Kashan and east of Ghohrud), is included in Central Iran structural zone and spread in contact with Ghohrud granitoid (Middle Miocene age) with shale, sandstone and limestone succession of the Jurassic age known as Shemshak Formation. Skarnification is made up of endo- and exoskarn subzones. Wide mineralization in these skarns hasn’t observed. Endoskarn subzone has limited occurence (from a few millimeters to a few centimeters) and exoskarn has the greatest development (from 1 meter to more than 10 meters). Endoskarn with the formation of the skarn minerals garnet, pyroxene, plagioclase, epidote and sphene, is formed in the intrusive host rock and is in the vicinity of the carbonate part. In its immediate neighborhood, exoskarn subzone starts with the formation of minerals garnet, pyroxene, idocrase, epidote, phlogopite, chlorite, quartz and calcite in the carbonate section. Mineralogical studies and textural relationship of minerals have shown that the metamorphic facies اhas reached to pyroxene hornfels in skarn rocks of this area. بدر، ا.، 1391- مطالعات سنگ­شناسی و کانی­شناسی اسکارن­های بخش شرقی گرانودیوریت قهرود (جنوب شرق قمصر، استان اصفهان)، پایان­نامه کارشناسی ارشد، دانشگاه اصفهان، 147 ص. رادفر، ج. 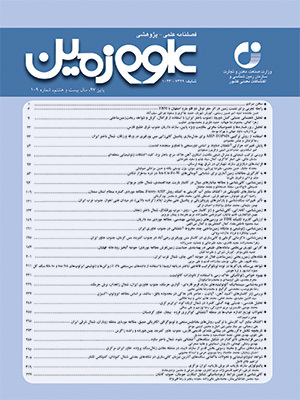 و علایی مهابادی، س.، 1372- شرح نقشه­ زمین­شناسی 100000/1 چهار­گوش کاشان، سازمان زمین­شناسی و اکتشافات معدنی کشور. زاهدی، م.، 1370- شرح نقشه زمین­شناسی چهارگوش کاشان250000/1، شماره ف 7، انتشارات سازمان زمین­شناسی کشور، 98 ص. قلی­نژاد، ر.، 1393- کانی­شناسی و ژئوشیمی اسکارن­های شمال شرق قهرود، کمربند ارومیه- دختر (جوینان)، پایان­نامه کارشناسی ارشد، دانشگاه اصفهان. Berberian, M. and King, G. C. P., 1981- Towards a paleogeography and tectonic evolution of Iran. Canadian Journal of Earth Scince 18 (2), 210-265. Bucher, K. and Frey, M., 1994- Petrogenesis of metamorphic rock, Translated by Valizadeh, M. V., and Sadeghian M., to Persian, Tehran University Press, 404p. Deer, W. A., Howie, R. A. and Zussman, J., 1992- Rock-forming minerals, orthosilicates garnet groups.1 A, 467-657. Einaudi, M. T. and Burt, D. M., 1982- Introduction, terminology, classification and composition of skarn deposits. Economic Geology 77, 745-753. Einaudi, M. T., 1982- Description of skarns associated with porphyry copper plutons, southwestern North America. Advances in geology of the porphyry copper deposits, southwestern North America. University of Arizona Press, Tucson, Arizona, 139-184. Farhoudi, G. H., 1978- A comparison of Zagros geology to island-arcs. Journal of Geology 86, 323-334. Ghasemi, A. and Tabatabaimanesh, S. M., 2015- Geochemistry and petrogenesis of Ghohroud igneous complex (Urumieh–Dokhtar zone): evidence for Neotethyan subduction during the Neogene. Arabian Journal of Geosciences 8(11), 9599-9623. Guilbert, J. M. and Lowell, J. D., 1974- Variations in zoning patterns in porphyry copper deposits. Canadian Institute of Mining and Metallurgy Bulletin 67, 99-109. Hochella, M. F., Liou, J. G., Keskinen, M. J. and Kim. H. S., 1982- Synthesis and stability relations of magnesium idocrase. Economic Geology 17, 798 – 808. Holland, T. J. B. and Powell, R., 1990- An enlarged and updated internally consistent thermodynamic dataset with uncertainties and correlations: the system K2O– Na2O– CaO– MgO– MnO– FeO– Fe2O3– Al2O3– TiO2– C– H2– O2, Journal of Metamorphic Geology, 8, 89– 124. Honarmand, M., Rashidnejad Omran, N., Neubauer, F., Nabatian, G., Emami, M. H., Bernroider, M., Ahmadian, J., Ebrahimi, M. and Liu, X., 2016- Mineral chemistry of a Cenozoic igneous complex, the Urumieh–Dokhtar magmatic belt, Iran: Petrological implications for the plutonic rocks. Island Arc 25(2), 137-153. Irvine, T. N. and Baragar, W. R. A., 1971- A guide to the chemical classification of common rocks. Canadian Journal of Earth Sciences 8, 523-548. Ito, J. and Arem, J. E., 1970- Idocrase synthesis, phase relations and crystal chemistry. American Mineralogist 55, 880-912. Jacobs, G. K. and Kerrick, D. M., 1981- Devolatilization equilibria in H2O-CO2 and H2O-CO2-NaCl fluids; an experimental and thermodynamic evaluation at elevated pressures and temperatures. American mineralogist 66(11-12),1135-1153. Jung, D., Kursten, M. and Tarkian, M., 1976- Post-Mesozoic volcanism in Iran and its relation to the subduction of the Afro-Arabian under the Eurasian plate. Afar between continental and oceanic rifting 2, 175-181. Letargo, C. M. R. and Lamb, W. M., 1993- P-T-X conditions of calc-silicate formation: Evidence from fluid inclusions and phase equilibria, Lianouplift, Central Texas, USA. Metamorphic Geology 11, 89-100. McQuarrie, N., Stock, J. M., Verdel, C. and Wernicke, B. P., 2003- Cenozoic evolution of Neotethys and implications for the causes of plate motions. Geophysical Research Letters, 30(20). Middlemost, E. A. K., 1985- Magmas and magmatic rocks. Longman. London. 266 pp. Nowroozi. A. A., 1971- Seismotectonices of the Persian plateau, Eastern Turkey, Caucasus and Hindu-Kush region. Bulletin of the Seismological Society of America 61 (2), 317-341. Omrani, J., Agard, P., Whitechurch, H., Benoit, M., Prouteau, G. and Jolivet, L., 2008- Arc-magmatism and subduction history beneath the Zagros Mountains, Iran: a new report of adakites and geodynamic consequences. Lithos 106(3), 380-398. Pearce, J. A., Harris, N. B. and Thindle, A. G., 1984- Trace element discrimination diagrams for the tectonic interpretation of granitic rocks. Journal of Petrology 25(4), 956-983. Perkins, H., Brown, T. H. and Berman, R. G., 1986- Three programs, which calculate pressure temperature composition diagrams. Computers and Geosciences. 12(6), 749-755. Richards, J. P., 2015- Tectonic, magmatic and metallogenic evolution of the Tethyan orogen: From subduction to collision. Ore Geology Reviews 70, 323-345. Richards, J. P., Spell, T., Rameh, E., Razique, A. and Fletcher, T., 2012- High Sr/Y magmas reflect arc maturity, high magmatic water content, and porphyry Cu±Mo±Au potential: examples from the Tethyan arcs of Central and Eastern Iran and Western Pakistan. Economic Geology 107(2), 295-332. Rickwood, P. C., 1989- Boundary lines within petrologic diagrams which use oxides of major and minor elements., Lithos 22, 243-263. Shimazaki, H., 1982- The Sasano hastingsite-bearing copper skarn deposit formed in aluminous sediment, at the Yoshioka mine, Japan. Economic Geology 77(4), 868-876. Takin, M., 1972- Iranian geology and continental drift in the Middle East. Nature 235(5334), 147-150. Titley, S. R., 1973- pyrometasomatism- an alteration type. Economic Geology 88, 1326-1328. Tracy, R. J. and Frost, B. R., 1991- Phase equilibria and thermobarometery of calcareous, ultramafic and mafic rocks and iron formation. Reviews in Mineralogy and Geochemistry 26(1), 207-289. Tunini, L., Jiménez-Munt, I., Fernandez, M., Vergés, J. and Villasenor, A., 2015- Lithospheric mantle heterogeneities beneath the Zagros Mountains and the Iranian Plateau: a petrological-geophysical study. Geophysical Journal International 200(1), 596-614. Winkler, H. G. F., 1976- Petrogenesis of metamorphic rocks. Springer- Verlag, New York, 25 pp. Yardly, B. W. D., 1989- An introduction to metamorphic petrology. John Wiley and Sons New York, 248 pp.